Tim Cook and company rocked today’s keynote. As expected, the iPhone 5s was announced with a new processor, fingerprint sensor and motion chip alongside the new cost-conscious and brightly-colored iPhone 5c. Craig Frederhigi spent some time on Jony Ive’s upcoming iOS 7, running through the main features, most of which we’d heard back at WWDC in June, including Control Center, Search anywhere, more textured ringtones and the like. The two new models of iPhone were the focus of today’s event. CEO Tim Cook said that the iPhone business was getting so big they decided to replace the iPhone 5 with two new models. The iPhone 5c looks to aim directly at kids and perhaps budget-conscious consumers with bright colors and the ability to purchase contrasting soft rubber cases. The iPhone 5s is a tour-de-force of new technology, including the much-anticipated fingerprint sensor, Touch ID, and the new A7 and M7 chips. The keynote was even more densely packed with info, of course, so we’ve broken everything down into tasty, bite-size nuggets of information so you can get essentials of what happened today without having to read 30,000,000 different blog posts. Desktop-class architecture, 2x general purpose registers. Over one billion transistors. The iPhone 5S has already been expected to feature a fingerprint sensor for months, and now The Wall Street Journal has corroborated the rumor less than 24 hours ahead of Apple’s planned unveiling of the device tomorrow. (2 a.m 1 A.M on the 11th Sept Malaysian time). “People familiar with the matter said last week that Apple will include a fingerprint scanner on the more expensive of two iPhones it is expected to unveil Tuesday,” according to the Journal. 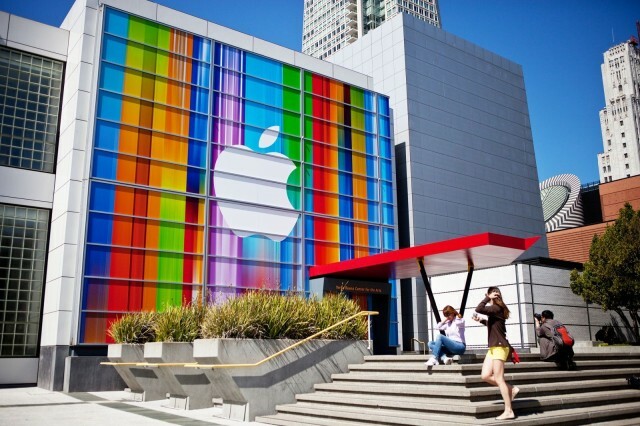 The second iPhone is rumored to be the iPhone 5C, a lower-cost, multi-colored iPhone 5 with a plastic back. Apple purchased a company called AuthenTec last year that specialized in biometric security, and a patent was recently filed by Apple that details the company’s designs for a reader built into a button. 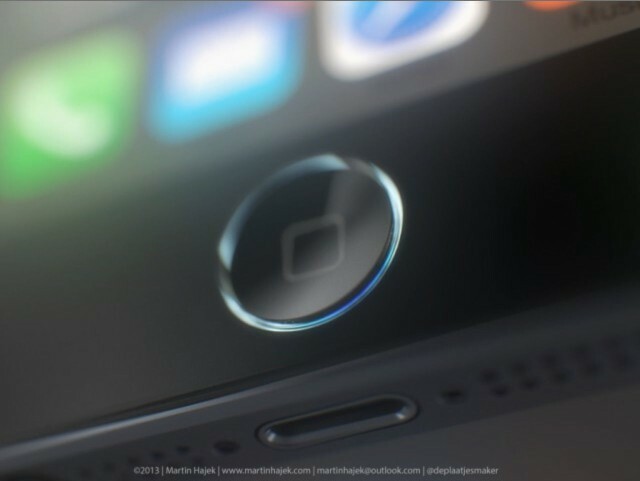 It’s believed that the 5S will feature a redesigned home button with a ring around the edge that will act as a capacitive scanner. Part of the Journal’s report notes that, “at least one new smartphone running Google Inc.’s Android operating system to be released this year will include a similar fingerprint sensor” as well. Stay tuned for more about the event and the new iPhone 5S and 5C. Apple’s iPhone event is happening in a fer hours time (2 a.m 1 A.M Malaysian time, 11th Sept 2013). We are anticipating the event to be as awesome as always! Apple’s making some huge changes to iOS this year, so what are the chances that the iPhone will undergo a similar transition? Based on what we’ve been hearing, the likelihood is pretty high; Tim Cook, Sir Jony Ive and the rest of the crew may show off not one but two new iPhone models for the very first time. We’re expecting to see both a 5S and a colorful 5C, but we’re still in the dark on when they’ll arrive, how much they cost and where they’ll be available. There’s always potential for a top-secret product nobody was anticipating, too. Follow the live blog here! 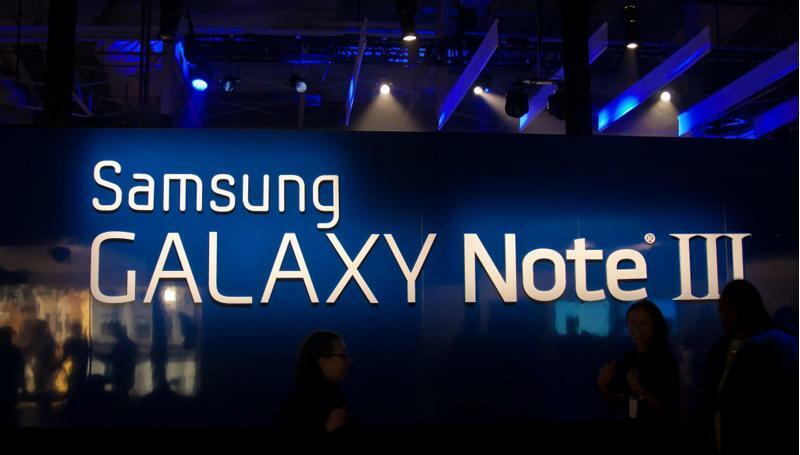 Earlier it was rumoured that the upcoming 5.68″ Galaxy Note 3 will come in 2 different variants of different processors just like the current Galaxy S4. Now a source close to Sammobile has revealed more confirmed details of the models with list of country availability. For Malaysia, we will be getting both 3G & LTE versions which is similar to the current Galaxy S4 availability here. With commercial LTE coverage being rolled out in Malaysia and Qualcomm’s better track record of power management, the LTE version for the Galaxy Note 3 would be a better pick between the two. All shall be revealed on 4th September and we expect Malaysian availability to follow closely right after. Hopefully they will launch both model simultaneously if it gets here. Hit the source link for the full country listing. 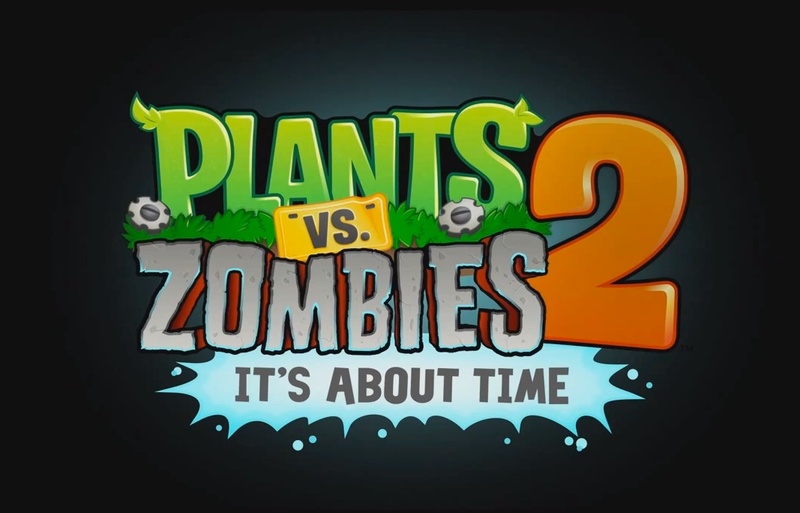 PopCap has finally gotten around to releasing the new zombie game that everyone and their grandmother has been waiting for — Plants vs Zombies 2: It’s About Time. It’s been three long years since we were swept away with the original Plants vs Zombies, but we’re happy to say that Plants vs Zombies 2 is just as fun and addictive as ever, if not more so. 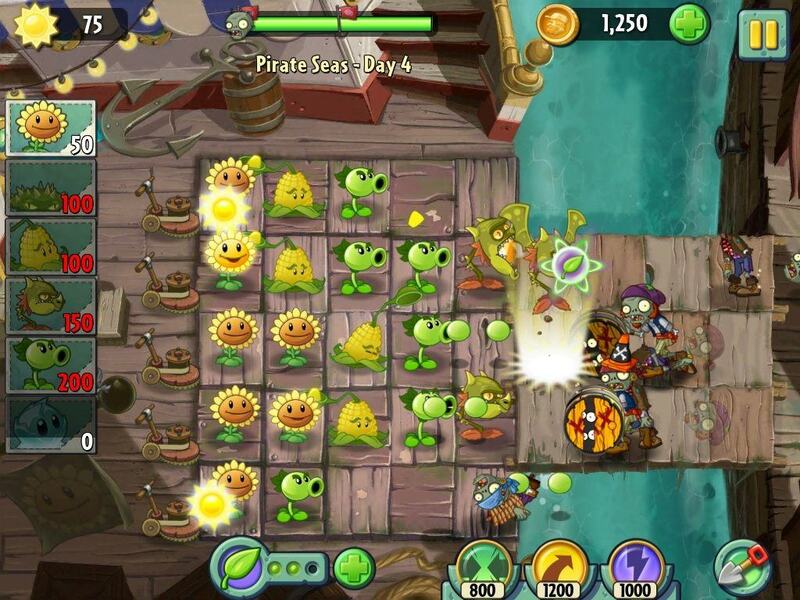 Yes, you still plant sunflowers, harvest sun, and then use that to get more plants to destroy armies of zombies. But even though the gameplay is still the same, the adventure is more fun than ever. Once again players are joined by Crazy Dave from the first game, except now he has a time-traveling RV that can transport you to three different time periods on his Time-Space Taco Map: Ancient Egypt, Pirate Seas, and Wild West. To advance to new time periods, though, players have to collect stars by beating levels and accomplishing objectives. Each time period comes with over 20 levels full of new zombies to destroy, which would be fun enough as is, but this go around, players will have to repeat levels later with new puzzles to gain more stars and unlock new areas of the map. 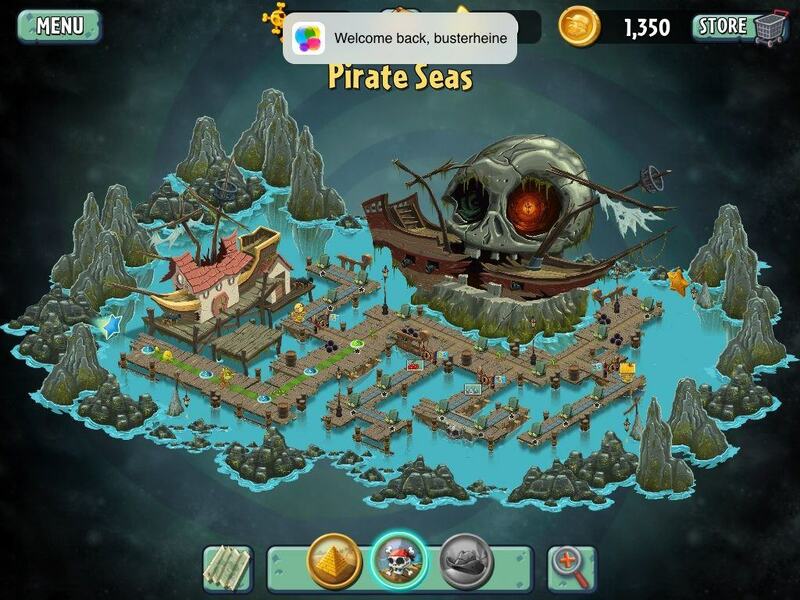 Some of the levels have to be replayed three times, with each new attempt bringing new objectives to earn stars. You can also go back and replay levels to find keys that unlock new branches of your map as well, leaving players with even more gameplay than the original. 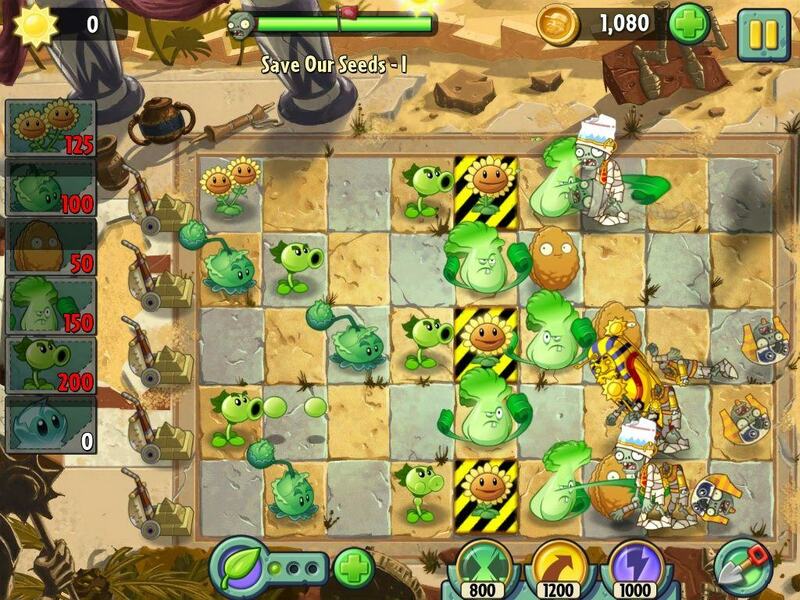 With so many levels to beat, you’d think that dropping plants on a board for hours on end would get boring, but PopCap has done a great job of mixing gameplay up by including new mini-games. 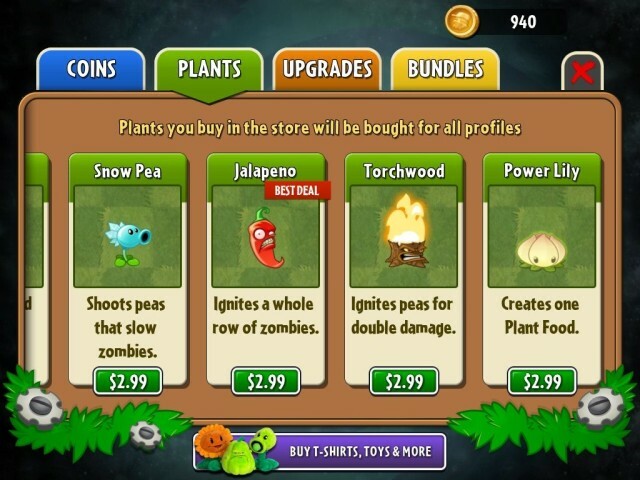 To help you defend your home in the crazy new worlds, Crazy Dave gives you a new power-up, called Plant Food, that the zombies drop and can be dragged over to one of your plants to activate its temporary super-powers. You can also save up to 3 bottles of plant food to use whenever you’re facing a big wave. Coins play a different role in the worlds of Plants vs Zombies 2 than they did in the original. Rather than being used to unlock plants, the new game comes with three power-ups that can be purchased in the heat of battle using coins, granting the player phenomenal cosmic powers long enough wipe the board clean. The new power-ups include Power Pinch, Power Toss, and Power Zap, which can be activated at the price of 800, 1000, and 1200 coins, depending on which power you want. All three are incredibly powerful and incredibly pricey, but you can usually beat levels without them. 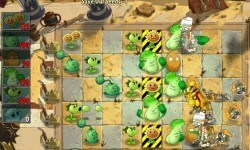 Along with the big new gameplay features, PopCap tossed in a few smaller features that make conquering PvZ2 a delight. Now the game syncs your progress through GameCenter so you can beat a few levels on your iPhone, and then pick up right where you left off on your iPad. They’ve also included slots for five different player profiles, so your spouse or kids can play on your device too and progress at their own pace without messing up your game. When PopCap made the announcement that Plants vs Zombies 2 would be ‘free-to-play’, a lot of PvZ fans were worried the game would try to squeeze every dollar it could from you to open up content, but that’s not at all the case here. Yes, you can buy coins, plants, upgrades and other bundles that will make the game easier for you, but none of them are worth it. You can beat the entire game without spending a penny, and you unlock different plants and upgrades along the way. Ads do pop up every so often after beating a level, but nothing obtrusive that ruins gameplay. The only reason to spend money in PvZ2 is if you’re nostalgic for some of the plants from the original, or you just need a mountain of coins to dominate a level with your super powers because you’re too lazy to beat it the regular way. The Good: Gameplay is just as fun and easy to pick up as the original, but new power-ups and plant food add a new dimension. New plants are even more entertaining and badass. Lots of depth and challenging puzzles that will keep players engaged for hours. The Bad: In-app purchases are always a bummer, but PvZ2 pulls it off as well as can be expected. The Verdict: Plants vs Zombies 2: It’s About Time is a solid sequel to the original hit. Rather than departing from the original, PopCap kept with what works best and upped the ante, with bigger worlds, better plants, and some phenomenal cosmic powers that make for one of the best games of the year. Download it not in Apple App Store for free! Apple will hold its next iPhont event on the 10th of September 2013 according to many sources and recently confirmed by Jim Dalrymple of The Loop (who is always right btw). Apple is expected to unveil the iPhone 5 successor, the iPhone 5S with the likelihood of a fingerprint sensor home button and the official launch of iOS7.The iPhone 5S would probably have the same design as the iPhone 5S which actually makes the fingerprint sensor home button more doubtful. We still think that it will only come with the iPhone 6. Not the 5S. Alongside the iPhone 5S, Apple is also expected to launch a lower cost, plastic, multi-colored iPhone 5C targeted for the lower-end and emerging markets. A new iPad which will look like a bigger iPad mini will also be announced alongside with a retina display iPad mini. But we are still doubtful that Apple will announce so many devices in one event. Probably they are going to hold another event sometime later for the iPads. We will see. In the other hand, OS X Mavericks will probably not show up on this event. Or it will. Lets see. 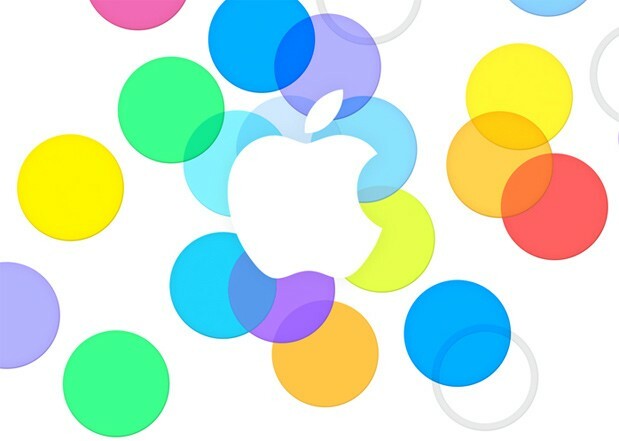 Mark your calender and hope Apple will deliver yet another awesome event this time around. Google recently announced the new Nexus 7 and it is really impressive. Apple will have alot of work to do to top this with its iPad Mini. Here we have a mini review on the new Nexus 7 for you. Its a very good review from ITProPortal.com. Have a good read. We apologize for being late. Balance – that’s the key. Last year’s Nexus 7 set the bar for small tablets with just the right balance of features, size, and price. This year, Google and Asus have done it again, balancing size, performance, and a wallet-friendly price to hit the sweet spot for a compact tablet. The new Nexus 7 is slimmer, lighter, and more comfortable to hold than the original, which was already more comfortable to hold than the oddly wide Apple iPad mini. This model measures 200 x 8.6 x 114mm (WxDxH) and weighs 290 grams, with tapered sides and a soft-touch back that somehow feels a little classier than the weird faux-leather of the original Nexus 7. Asus still understands that narrowness, more than anything else, is key to making a device you might sometimes want to hold in one hand. There are very few ports here – just microUSB, a headphone jack, and a microphone – and narrower, but not very narrow, side bezels framing a sharp 1,920 x 1,200 screen. The screen is the big advance here. 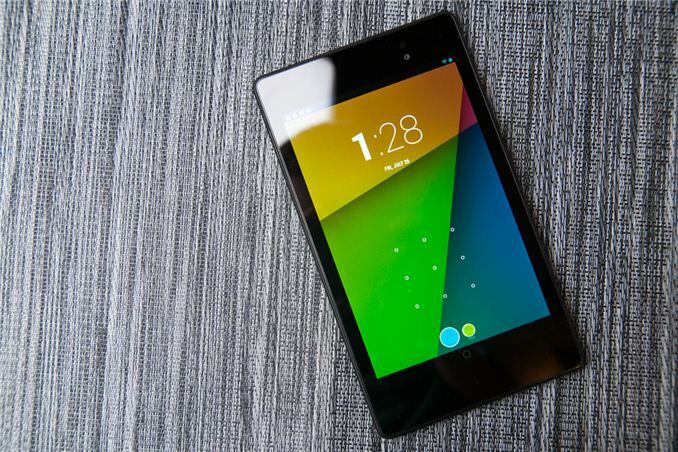 Asus swapped out the Nexus 7’s original 1,280 x 800 screen with a gorgeous 1,920 x 1,200-pixel IPS LCD panel. At 323 ppi, it’s almost exactly the same density as the iPhone 5’s Retina display and higher than any iPad. It’s bright enough for most circumstances, colours are very true, and the viewing angle is good – but it’s also small enough that the screen doesn’t totally kill battery life. We got 7 hours and 37 minutes of video playback with the screen turned up to max brightness. While that’s definitely shorter than the 10 hours that last year’s model, with its less dense screen, managed, it’s still quite respectable. The Nexus 7 comes in three models. The first two are Wi-Fi only, with support for 802.11a/b/g/n on the 2.4GHz and 5GHz bands – the support for faster 5GHz Wi-Fi is another upgrade from last year’s version. The 16GB Wi-Fi model has gone on pre-order for £199 (expected to be RM999), and the 32GB version (which we were sent for review) retails at £239 (possibly RM1199). The third unit packs 4G LTE support and will retail at £299 (RM1499) (with 32GB of storage – there’s no 16GB option with the LTE slate). All of the models have GPS, which makes this bright little tablet an absolutely killer in-car navigation system. The GPS on my test tablet locked in very quickly. The tablet also has Bluetooth 4.0 and NFC, although surprisingly there’s no support for Google Wallet. Maybe Google Wallet is a thing of the past. The Nexus 7 is the first Android 4.3 tablet, running a 1.5GHz quad-core Qualcomm S4 Pro APQ8064 processor. Think of it as about two-thirds of the way up the current performance ladder, with the Samsung Galaxy S4 phone at the top. It almost doubles the performance of last year’s Nvidia Tegra 3-based Nexus 7 on pure processor and graphics benchmarks, and positively crushes the iPad mini on the Geekbench system benchmark: The mini scored only 748, while this guy registers 2,643. The Chrome browser beats the iPad mini on the Sunspider browser benchmark by about 30 per cent. Real-world performance isn’t solely dependent on processor speed: It’s dependent on how many pixels you’re pushing, the OS, and third-party apps. That’s where the Nexus 7, running Android 4.3, runs into a bit of trouble. I run the same bunch of Android apps every time I test a tablet, and some of them either didn’t show up in the market or got buggy on the Nexus. Need for Speed: Most Wanted, for instance, suffered from weird graphics artifacts. The UI in Netflix was sluggish, although videos played just fine. Asphalt 7: Heat, one of my standard test games, didn’t even show up on a search. Sometimes when searching Google’s own Play store, animations would get jittery or the text entry box would lose focus. The popular video player MX Player quit on launch. I suspect a lot of these problems are Android 4.3 issues which will get solved quickly as the app creators update their work. I didn’t see any such problems in Google’s other built-in apps, and other apps such as Riptide GP2, Paper Monsters, Dead Trigger, and Photoshop Touch ran just fine. Most importantly, Google’s Chrome browser runs very, very well here, as do Netflix and Amazon’s Kindle app. I’d still recommend e-ink e-readers to many people because of their vast reserves of battery life and sunlight readability, but this will do a great job with children’s books and comics. This has always been Google’s struggle with Android tablets: Making sure third-party apps are up to speed with the platform. Google has changed the home page of its Play store so only tablet-friendly apps show up, although you can still find “ugly” apps not designed for tablet screens by searching for them. Those apps still don’t look too bad on a 7in screen; it’s really with 10in tablets that you’ll run into problems. Apple’s iPad mini has a superior app experience, it’s true. You’ll find more and better apps in Apple’s app store, and they’re pretty much all guaranteed to run smoothly. But the Nexus 7’s app situation is good enough for that not to be a deal-breaker. Android 4.3’s other flagship feature makes this an excellent kids’ tablet. Android 4.2 allowed for the creation of multiple user accounts on your tablet, and now “restricted profiles” have been introduced to let you create accounts that can only use certain apps. I created one and found that the restricted account was locked out of the Google Play store. YouTube threw up an error message but worked anyway; all the other apps I allowed my virtual child to use worked fine. With no memory card slot, I suggest buying the 32GB Nexus 7 (with 26GB of storage available) over the 16GB unit. The price difference is only £40, and you’ll want the space. The new Nexus 7 adds a 5-megapixel rear camera to the tablet, keeping the 1-megapixel front camera as well. The new Android 4.3 camera app’s UI is extremely simple, although you still get some options like capture size, a countdown timer, a few scene modes, panorama and Photo Sphere. Photos taken with the main camera were clear enough in good light, although bright areas were washed out and there was some visible colour noise. In low light, the noise really ramped up. Front camera images tended to be very soft, even smeary (but not blurry) in low light. The main camera captured 1080p video at 30 frames per second indoors and out; the front camera captured 720p at 30 frames per second. There’s no image stabilisation, but there is a time-lapse mode. The front camera is fine for video chatting, and the main camera will do just fine for augmented-reality apps, bar code scanners, language translators, and all the things you really should be using a tablet camera for. People taking snapshots with tablet cameras generally look like idiots – don’t be one. Asus amped up the volume of the stereo speakers here, and they’re now quite loud, although they’re still tinny. Fraunhofer surround sound gives some real stereo separation in material coded for it, like Google Play movies. Still, the only way you’re going to get bass is with headphones. The Nexus 7 had no problem playing MPEG4 and H.264 videos in resolutions up to 1080p, as well as streaming Netflix and Google Play movies. There’s no DivX or Xvid support by default. The Nexus 7 doesn’t come with any wired means to output video to a TV, but it works with Google’s new $35 (£23) Chromecast to play some streaming (not local) media on TVs, and there’s also a SlimPort micro-USB-to-HDMI adapter available that works with this Nexus 7 and last year’s Nexus 4 smartphone. The new Google Nexus 7 will be the right small tablet for most people when it comes across to the UK (hopefully pretty soon, according to Currys it will be September). Regarding rivals, the cheaper £159 Amazon Kindle Fire HD is only the right choice right now if you’re heavily invested in Amazon’s media world, although a new and more competitive model is probably coming soon. If you want to go a lot cheaper, then obviously you’ll be sacrificing a great deal for a really budget Android slate – not the least of which will be the new Nexus 7’s superb screen. At the higher end, the £269 iPad mini has an unmatched range of apps, but you’ll pay for that heavily in terms of a grainier screen, higher price, and more awkward form factor. And the £339 Samsung Galaxy Note 8.0 has a Dirk Diggler-like “one special thing” in terms of its pen support, although you should only commit the cash if you need that pressure-sensitive pen. Small tablets are most often used for some media, some gaming, some web browsing, and some e-reading. Provided third-party developers update their apps for Android 4.3 – and I think they will, soon – the new Nexus 7 is ideal for all of those, thanks to its sharp screen, comfortable ergonomics, and solid performance at an ideal price. All this means that Google’s latest tablet effort gets one of our Best Buy awards. Write in to us for any queries!